There’s a dark secret in the rock community that the musicians and fans have long tried to hide. Something unspoken and papered over, but glaringly apparent if you’re willing to confront the truth. For as much as most rock fans hold pop music in distain and would rather pretend that they are immune to the fashion trends or publicity hullabaloo that creates and repackages pop stars (i.e. reinventing the product), rock’n’roll is part of the same beast. Given the pathos that’s so ingrained in rock, the idea that it could be designed by a songwriter for a particular demographic or part of an “American Idol”-type scamper up the mountain top to a major label deal dispels the romantic image. Bands are often in a catch-22. They either follow in Fugazi’s footsteps and play the music via the underground scene with monastic fervor, or they risk being labeled sellouts by competing for mainstream tastes. So, it’s oddly hypocritical when fans will turn their nose up at a band like Yellowcard for being “too pop” or for having a violinist in the band. Is anyone under the illusion that young cats Linkin Park or even old lions like Paul McCartney are above the demographic research and politicking that comes with being rock stars? 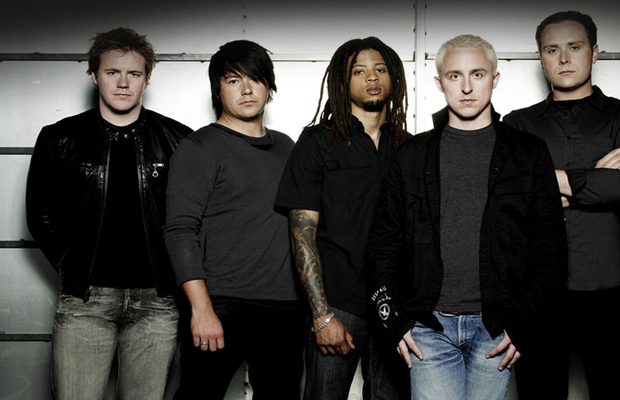 Like Linkin Park, Yellowcard is marketed for high school-aged young males. The music is kind of heavy but accessible and the lyrics are full of anger, typically dealing with romantic torment. But the angsty songs show as much maturity and complexity as a gorilla getting all agitated on a Discovery Channel documentary. As a bonus, the band members are mildly cute and the songs’ choruses are tweaked to appeal to their guy fans’ girlfriends. Following up their multi-platinum, major label debut, Yellowcard’s new “Lights And Sounds” is the group’s most important disc as the band is essentially fighting a battle on two fronts. First, they — like most artists — have to convert those unfamiliar or hostile to them that they’re legitimate talents and a band to be reckoned with. Second, they must convince their loyal fans that this record’s heavier yet more polished sound doesn’t mean they’re lapsing into becoming an easily digestible metal band. “Lights And Sounds” is a solid, slicker record, and this makes their fight both easier and more difficult. Tracks like the hard-hitting “Lights And Sounds” and heart-in-your-throat rocker “Waiting Game” are ideal radio products, showing a bit of grittiness and yet are accessible enough to slide onto playlists. This will bring more fans to the band’s shows. However, as the number of fans increases, the band should lose any remaining aura of authenticity that they have. An ideal example of their radio-friendly stock-in-trade is “Sure Thing Falling.” Ducking around and in front of a crushing tidal wave of guitar chords, vocalist Ryan Key guides a robust melody. It’s weird. His voice swerves between an imitation of Green Day’s Billie Joe Armstrong and piano man Ben Folds depending on whether the guitar is pulverizing you during the chorus or is rolling back for the verse. In fact, Folds’ influence is apparent on several tracks. On “City Of Devils,” Key borrows Folds’ vocal cadences. A couple of songs later on “Gray,” Key duplicates the man’s trademark falsetto perfectly. For “Two Weeks From Twenty,” the impersonation is so exact — musically, vocally — you’ll swear this is some sort of Milli Vanilli scenario. Is that you, Ben? On “How I Go,” we get to hear what it would like if Ben Folds sang with a Dixie Chick … oops … I mean Yellowcard. Chicks’ lead singer Natalie Maines lends some tasteful vocal support for the songs’ swooning, string-filled chorus. Oddly, for as much dissing as the band has had to endure for keeping violinist Sean Mackin on the payroll, his contributions are normally inaudible except for a couple of maudlin moments in a few songs. These are the same interludes when most non-pop bands would do the same thing, but they’d hire a classical musician who is looking to do some slumming with a rock band. I think that’s a smart business sense on Yellowcard’s part to keep Mackin around. Violinists need health insurance and groupies, too. “Lights And Sounds” is an inviting collection that should bring in new listeners to band, but true enough to the band’s fundamental sound so as to reassure their base. A warning to the band: They must be aware that as they openly embrace pop music, they also welcome its audiences’ fickleness. Should musical fashions change, Yellowcard might quickly find themselves on the pop music junkpile. Tags: "Lights And Sounds", review, Yellowcard. Bookmark the permalink.